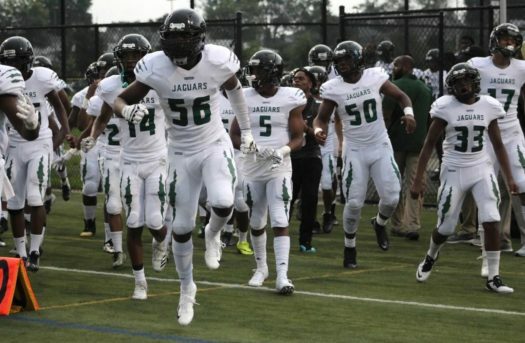 On Friday, September 7,2018, the CH Flowers Jaguars football team traveled to Bel Air, MD to take on the Bel Air Bobcats. The Jaguars defense got out to hot start with two sacks on the first drive forcing a 4th down and long before a lightning strike caused the game to be delayed for 45 minutes. The game resumed, and when play picked back up, the Jaguars decided that this game was going to be won on the ground with the run game. So senior running back Jemuel Cypress and junior running back Tristan Shannon got to work! The two combined for over 150 yards rushing! Senior quarterback Julius Duvall capped off the 3 scoring drives with touchdown runs! Including the game winning touchdown run with 40 seconds left on the clock to put the Jaguars up 20-13! Then the Jaguars defense put the game away with an interception by senior defensive back Sulton Woolbright! This was a great win on the road against a well coached opponent! Good luck next week Jags as we take on the Eleanor Roosevelt Raiders! Go Jags!